In a dispute between states’ rights and the congressional power to tax, you would expect conservatives to line up with the states and liberals with Congress. As the battle lines are drawn in State of New York v. Mnuchin, a lawsuit filed last month by the states of Connecticut, Maryland, New Jersey and New York, it will be Republicans defending the power of Congress and Democrats rallying to the cause of the states. 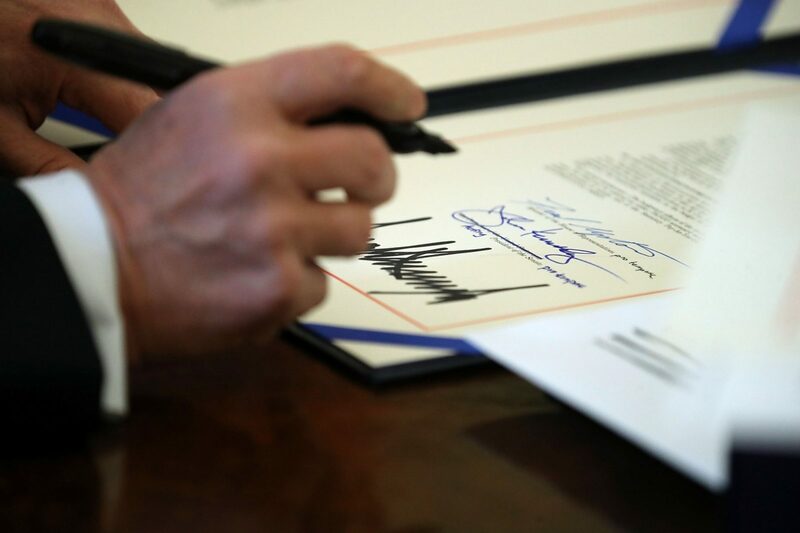 While well off most people’s radar, the case has the potential to disrupt President Donald Trump’s signature legislative achievement: last year’s massive tax cut. What remains to be seen — and will largely determine the outcome — is whether judicial conservatives align with Republicans (as they usually do) or defend the states’ rights doctrine at the heart of their legal thinking. The lawsuit attacks the tax cut passed at the end of last year by the Republican-controlled Congress, specifically its limits on the deductibility of state and local taxes. The law resulted in much higher federal taxes for many residents of high-tax states, most of which are governed by Democrats. Last month, the states brought suit in federal court in Manhattan challenging the constitutionality of this provision of the new law. The legal consensus is that the lawsuit is unlikely to prevail. But the strange bedfellows of this issue may be causing legal analysts to underestimate its chances. The new tax law breaks sharply with the past. Every federal income tax law since 1861 (and, more relevant, every one since the enactment of the 16th Amendment in 1913 giving Congress the specific power to levy income taxes after the Supreme Court limited that power in 1895) has permitted unlimited deductions of state and local tax payments when calculating federal income tax. Nearly 30 percent of all taxpayers took advantage of this provision in recent years; it was available only to those who itemize deductions. The 2017 law limited deductions for state and local taxes to $10,000. The central argument of the lawsuit is that the new law amounts to the federal government illegally usurping a core power of the states — deciding how to raise and spend money. Specifically, the states contend, the law makes it harder for them to maintain high tax rates to fund government programs, from the New York subway system to public schooling. One way to think about the law, which could yet prove important to the courts, is that it strong-arms liberal states into adopting conservative fiscal policies against their will. In fact, the lawsuit contends, that’s exactly what Republicans in Congress and the Trump administration had in mind. Another way to think about the new law is that it effectively legalizes taxation of more than 100 percent of income for high earners in high-tax states. If the law were upheld, and, say, California or New York (both states where progressives dominate politics) decided to enact very high income-tax rates for the highest earners — for example, those receiving over $10 million annually — these people could be on the hook for a combined federal and state marginal rate of more than 100 percent. Such a policy would be literally “confiscatory,” conservatives’ favorite epithet in opposing higher taxes. And this illustrates the rub of the matter: It is — or has been — a basic conservative principle for decades in the United States that confiscatory taxation is anathema. At the same time, conservatives have also traditionally sought to maximize the freedom states have to chart their own course in many realms, very much including taxation. Liberals, conversely, traditionally express solicitude for progressive taxation, especially for the highest earners. (Bernie Sanders, for instance, in his 2016 campaign proposed a 52 percent marginal federal income tax rate for those earning $10 million or more.) But liberals have also often sought to constrain the ability of states to place effective limits on federal policy. Put another way, if the Constitution forbids a combination of state and local federal tax levies in excess of 100 percent of income — which many conservatives and some liberals would agree it does — it would be the classic conservative position that the burden of this limit must be borne by the federal government, while many liberals might be inclined to limit state power. Should the case ultimately reach the Supreme Court, the question will be whether conservative jurists take the side of conservative politicians, which would accord with their policy preference for the tax bill, or whether they will hew more closely to their usual judicial principles, at the risk of dealing Republicans a significant policy defeat. (Ruling the limitation on state-tax deductibility unconstitutional would likely not invalidate the tax bill as a whole, but it would blow a much larger hole in the federal budget, which is already running record trillion-dollar deficits.) Those taking a longer view might also worry whether upholding the expansion of effective federal power over state taxation embodied in the new law might, in some future liberal congress, be used to compel states to raise taxes instead of lower them. Liberals, too, face a difficult moment. Liberal legal scholars, many of them normally sympathetic to high-tax arguments (and many themselves residents of high-tax states), are deeply uncomfortable with both limitations on Congress’ 16th Amendment taxing power and with arguments favoring states’ rights under the Constitution’s 10th Amendment, as are central to the new case. (The 10th Amendment declares that “the powers not delegated to the United States by the Constitution, nor prohibited by it to the States, are reserved to the States respectively, or to the people.” It is a favorite subject of academic legal conservatives, and something of a bugaboo for liberals.) This may help explain why the lawsuit has received so little attention in the press, which often relies on these same scholars for constitutional analysis. Of course, it is possible that politics will trump law, even in the courts. That is essentially what happened in perhaps the most consequential Supreme Court case of recent times, Bush v. Gore, which decided the disputed presidential election of 2000. In that case, in legal terms, the central issue was also one of states’ rights, or at least deference to a state’s conduct of its own affairs, in particular Florida’s approach to counting ballots cast there. One way to read the result in Bush v. Gore is to observe that every single justice on the court voted their politics over their usual judicial principles, with “conservatives” adopting the pro-federal government legal position usually favored by liberals while judges named to the bench by Democratic presidents took the opposite view. For those who feel certain the states’ case on the tax law will be quickly brushed aside, it’s worth recalling the legal maneuvering that followed the enactment of Obamacare. For the first 10 months after President Barack Obama signed the Affordable Care Act into law in March 2010, the consensus in much of the legal community was that constitutional challenges to the landmark law bordered on frivolous and were going nowhere. Two federal district courts upheld the law, and the legal theory in a third case, where a judge had said the law was unconstitutional, was suspect — and was ultimately rejected by appellate courts. Then yet another district court opinion came in against the statute, and it was taken much more seriously. For the next 17 months, Obamacare hung by a legal thread, before finally being largely upheld by the Supreme Court by the narrowest of margins, 5-4. The result in the challenge to last year’s tax law is impossible to predict. But it seems easy to credit the notion that lots of people will find themselves squirming before State of New York v. Mnuchin is concluded.